Could your idea be the next big thing in Aged Care? Calling all hackers (geek/coder), hipsters (creative/design), hustlers (pitcher/seller), consumers & carers, and anyone else passionate about improving outcomes for older Australians - the innovAGE hackathon has returned! Hosted by Leading Age Services Australia (LASA) at Gurrowa Innovation Lab Melbourne, the innovAGE hackathon aims to encourage entrepreneurial thinking to improve the lives of older Australian’s and their families. It is an intergenerational innovation event, open to anyone and brings together community members, developers, designers and entrepreneurs to develop age related solutions (services and products). Over the weekend of 25-27 November 2016, teams will work to design and build a working prototype of their proposal. This can be anything that integrates technology (i.e. mobile application, website or software linked to wearable hardware). While a maximum of five people are allowed in each team, organisers still encourage people to register to participate. “Don’t worry if you’re flying solo as we’ll help you find a team on the first day of InnovAGE,” say organisers. Real customers and service providers are also available to help teams further understand the challenges and opportunities faced by the Aged Care industry and leaders from the local tech community will mentor teams through the weekend. 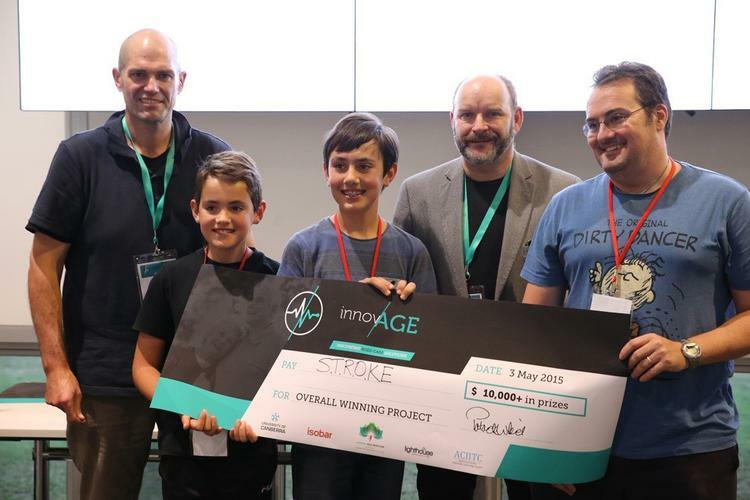 Last year’s overall winning team was Joshua (13), Kaiden (10) and father, Donovan Edye from ACT, who won the accolade for their STROKE (Stroke Therapeutic Rehabilitation Occupational Kinect Experiment) project. They were inspired to find a way to help stroke patients improve their upper locomotive function after their grandfather was hospitalised by a stroke but wasn’t motivated to continue his rehabilitation exercises when he returned home. After a weekend of innovation, mentoring and workshops, teams will pitch their solutions to an experienced judging panel for the opportunity to win some fantastic prizes on Sunday afternoon, 27 November.